It’s 9am and you have less than five minutes to get out the door before you’ll be late for work. You’ve already tried four different wraps. One made you look tired, the other clashed with your shirt, the third scarf was perfect but every time you wrapped it, it slipped, and the fourth stayed put but looked too casual for that meeting you have coming up today. Your arms and wrists are cramping from holding them up above your head so long. You feel like screaming and throwing every scarf you own out the window. Your husband comes in and asks innocently if you’re ready and you contemplate throwing the scarves at him instead of out the window. If this has been you… you’re not alone. We’ve ALL been there. 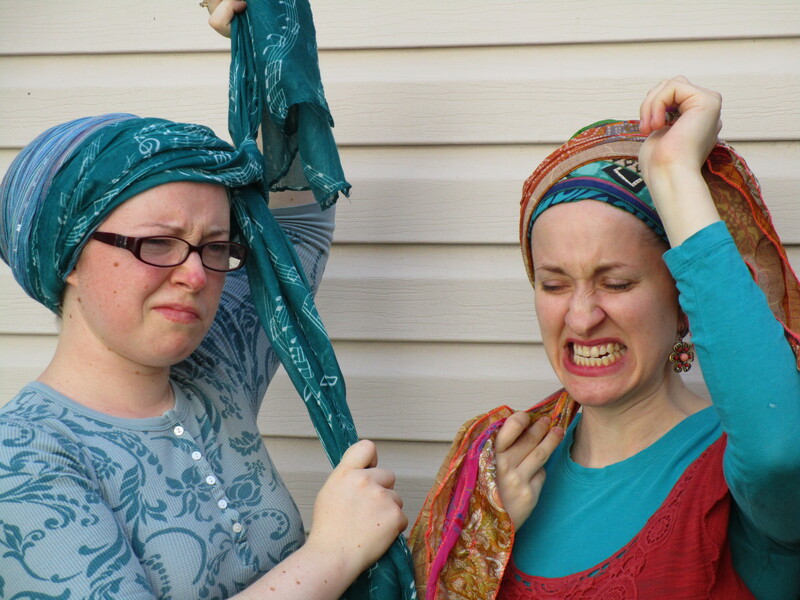 Regardless of whether we’re beginners or experienced wrappers with decades of practice, we can’t avoid the occasional TICHEL TANTRUM. This gorgeous and oh-so-appropriate term was coined by Heather, one of the original members of our Wrapunzel Fangroup, and it enjoys frequent use to this day. One memorable day, a Fangroup member wondered whether women who cover their hair with something other than a tichel suffer the same kind of tribulations. What would we call it if a Muslim woman struggled with her hijab, or an Israeli with her mitpachat*? We’re loving it! Hopefully this list will convince you that no-one escapes this universal hair-covering experience… we’re tempted to tape it up in the bathroom for some perspective. Can you relate? 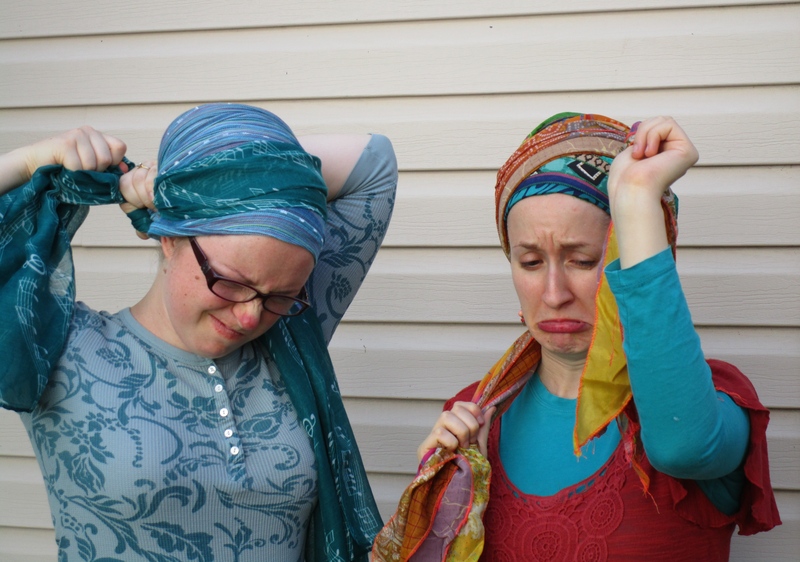 Share your experiences (or your favorite words for tichel disasters) in the comments! We’d love to hear from you! PS – Now will someone PLEASE show me how to tie this turban?! ***Nachat, or its Ashkenaz variation, nachas, is a word denoting pride/gratification coming from an achievement. BTW, when will the blue tapestry be available? I can´t wait for it to order one!!! Andrea’s tantrum faces are awesome. Too many giggles. Quick! Get me a shot of turban bourbon! I love you ladies’ humor. I’ve had my share of pashmina perturbation. You’re right! Thanks for reminding us. I personally have kerchief kerfuffles. And am generally cheered with serendipitous sparkles, as I invariably put something shiny somewhere on my head. Hilarious. Andrea’s face here is classic. I been there done that. Specially in the mornings when my husban has to go to work and my car in right behind his truck, he says put your had on and move the car Noone is going to see you. Sometimes I ask my self does he even undestands the love I have for my head covering. But how do I explaine to him ? Cute very cute. Thanks for the humorous but very true article. And I thought I was the only one in the whole wide world who had tichel problems…I love this!!! I’m brand new to wrapping (Reform Jewish woman who wants mire than a wedding ring telling others I’m married.) and thus far this has been my life. Mitpachat mania seems to be the order of the day. Thus far I’ve yet to succeed in wrapping… but I’m sure success is just around the corner. Till then chai tea and morning cosmeration cuddles from my 2 littles will suffice. so funny lolz.yep so not cool when i have to miss b/fast before wrk because i cant tame my tichel. Haha, brilliant! I found ‘wrap rage’ especially hilarious! Oh so funny and true!!! Thank you for this. With me, it’s hijab histerics 🙂 which sometimes can end in a healing hijab or a howling hijabi…. When I have a bad day, I’ll think of these.